Carex buchananii is also commonly known as the New Zealand Leather Leaf Sedge. It is extremely hardy and will grow in any position except total shade and is not really fussy at all regarding the soil. This evergreen plant's appearance is much the same in winter as it is in the summer. However in summer you are aware that it is alive when you see seed heads appearing. It does make a good contrast for other plants and when the sun rays fall upon it, it takes on whole new light. 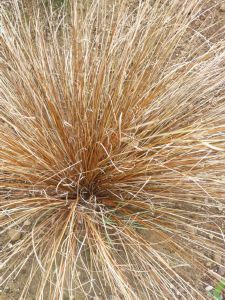 In mid-summer when this Carex starts to get untidy, get out a large pair of scissors, gather the whole plant in one hand and cut a good few inches off. A superb evergreen plant, great for a mixed perennial border, for show-stopping block planting, or even as a feature plant in a container. It's extremely versatile, tolerating almost any soil, and aspect. Its narrow, triangular blades are bronze-red and flex gracefully in the breeze. It is disease and pest-resistant, and being evergreen, it is very low-maintenance. Upright habit to 70cm. Pruning \ Aftercare : Prune tired foliage occasionally in spring.